Two shots of a very large (15 cm.) Amanita rubescens - The Blusher. I hadn't previously found this on the hedgerow. The size of the specimens I'm currently finding - and the numbers of them - suggest that this is going to be a very good year for fungi. This 2.5 cm. 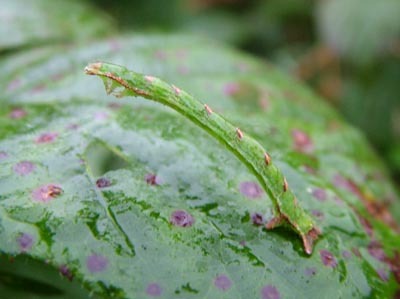 caterpillar was stretched out on a Bramble leaf. Colour camouflage 10/10. Positional camouflage 1/10. Beautiful Carpet - Mesoleuca albicillata. 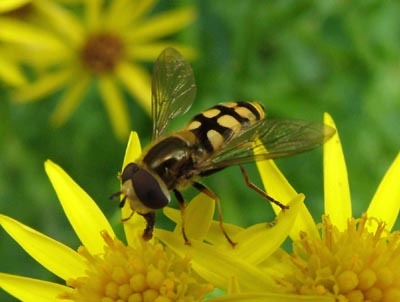 Another new hoverfly for me. It's certainly a Eupodes sp., and I think it's Eupodes corollae, but that's supposed to be scarce in Ireland. Good strong pattern. 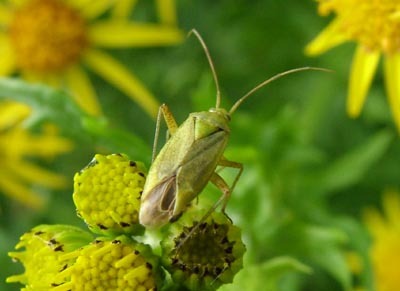 And another shot of the Green Capsid Bug. 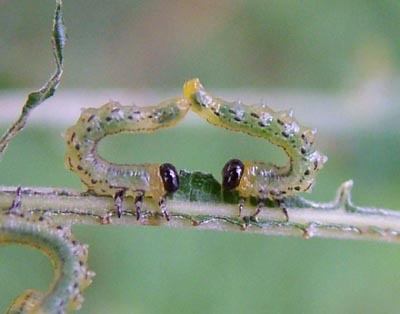 These are the larvae of the Lesser Willow Sawfly - Nematus pavidus.